Elismetrep is a non-opioid analgesic drug candidate. SAR7334 is a potent TRPC6 (Transient receptor potential cation channel, subfamily C, member 6) inhibitor. Icilin(AG 3-5) is a synthetic super-agonist of TRPM8 ion channel. HC-070 is a potent inhibitor of TRPC4 and TRPC5, leading to anxiolytic and antidepressant effects in mice. TRPM8 antagonist 14 is a potent, selective TRPM8 antagonist with IC50 of 0.2 nM in calcium influx assays, shows no activity on TRPV1; shows significant target coverage in both an icilin-induced WDS (at 1-30 mg/kg s.c.) and oxaliplatin-induced cold allodynia (at 0.1-1 μg s.c.) mice models. Probenecid is a potent and selective agonist of transient receptor potential vanilloid 2 (TRPV2) channels. 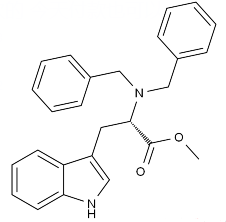 SAR7334 hydrochloride is a potent and specific TRPC6 inhibitor, inhibiting TRPC6 currents with IC50 of 7.9 nM.